Escaping is only the first challenge she faces. Fifteen-year-old Ayla Vaskell is the youngest daughter of the deceased king of Crio and no less determined to reclaim the kingdom from her evil uncle. He killed her parents, claimed the throne, and threw Ayla and her three sisters in a slave camp for children. With their powers bound, hope for a future is lost. Until Dain demands her attention and reveals that he and his friends were sent to aid the princesses in putting an end to the mad kingâs reign. After breaking out of the camp and fleeing to an inn outside the kingdom of ice fae and water dragons for shelter, Ayla is giving a journal that belonged to her father. The former king had left the girls clues to help along a journey they arenât sure they are ready for. When she is also given the first relicâa frozen dragonâs tearâsheâs drawn to it and knows what she must do. With Dain, his friends, and her sisters at her side, Ayla is more focused than ever to complete her mission to set the realm back in balance. If she fails, the realm, and the four kingdoms within it, would be lost forever. 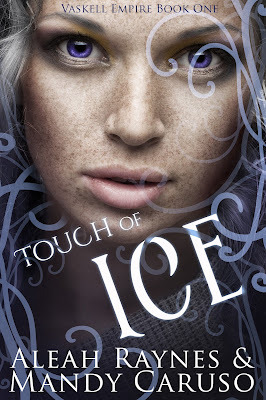 Touch of Ice is the first in a NEW YA romantic fantasy adventure series and a world of magic, dragons, fae, and other mythical creatures. Footsteps stopped just inside of the ballroom. And there she was. Corinne, Maryâs mom and our nursemaid. The scowl on her face made me look away. We were in trouble. But Corinneâs form of punishment was to make us clean up our mess, then some other task that involved cleaning. And we had to do it without using our magic. âLook at her wings!â Corinne stormed across the vast ballroom. I glanced over my shoulder but couldnât see much. The weight said enough. My wings were coated in the slime my sisters threw on me. A giggle escaped. I couldnât help it. This was payback for what I did to them last week. It took them days to get all the honey and feathers off theirs. âI donât understand you girls.â Corinne gripped my upper arm and tugged me to stand. When she started toward the bathroom at the back of the room, Baxter, our fatherâs soldier in arms, burst into the room. His features were darker than Iâd ever seen them. His brows bunched and his eyes were dark, commanding. My heart pounded. Something was wrong. Corinne stopped and stared at him. I could tell by the way her face paled that she, too, knew something happened. Or was about to. Baxter advanced to us, motioning for my sisters and Mary to gather around Corinne and me. He was in full battle gear with his helmet under his arm. Cold fear sliced my insides. We were being invaded. Most children didnât know the severity of being invaded. We, however, had been trained for such an event. The day our mother banished her brothers from the kingdom for threatening her and our fatherâs lives, a seer told them our uncles would seek their revenge. So, we were trained. Trained to fight and run. I couldnât hold back the panic any longer. I used my magic to clean off the slim, dissolving it into dust that settled to the floor. Corinne gripped my hand and pulled me behind her. I met each of my sistersâ scared gazes. This was no drill. My bottom lip trembled and my eyes watered. Just as we reached the secret passage to the stairs that descended to the caverns and river underneath the castle, soldiers in uniforms I didnât recognize charged inside the ballroom. Baxter drew his sword and sounded an alarm. The clanking of swords faded as Corinne led us deeper underground. I shook all over, and my ice magic became uncontrollable. She stopped and glanced back as if deciding to go join the battle. That was part of the plan I never understood. How were a group of kids supposed to reclaim a kingdom from a madman? Aleah Raynes loves paranormal, fantasy, mystery, suspense, reverse harem, and anything else that hooks her from the first page. She writes new adult and young adult fiction and romance in the genres she loves to read. She is co-authoring the Vaskell Empire series with Mandy Caruso. Book one, Touched of Ice releases September 2017. And her debut solo novel, Visions of Pain (Capissian Order, book 1) - a clean new adult reverse harem â releases in October 2017. Mandy Caruso, alter-ego of TL Reeve, came to be after a long conversation with her daughter. A lover of all types of story, she enjoys anything with a quality plot and awesome characters. When she isn't writing, you can find her hanging out with her daughter or reading a good book. You can contact her at: authormandycaruso@yahoo.com.